Air Filters prevent foreign particles like dirt, soot, carbon and abrasives from entering the fuel mix and damaging your engine. Even small particles can damage cylinder walls, pistons and piston rings, causing premature engine wear. In fact, it only takes eight ounces of dirt to destroy the engine of a heavy duty machine. That’s why choosing the right air filter is critical to the life of your engine. There are many components to consider when selecting an air filter. Our products come from leading global filtration specialists, who design their products with performance, structure and fit in mind. 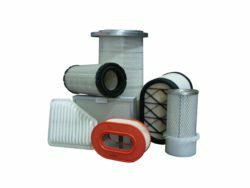 Filters Plus supplies air filters that use higher quality compounds like silicone sealing gaskets, rather than foam or rubber, in order to assure a proper seal under harsh conditions. Additionally, our air filters feature precise embossed pleats, stabilisation beads, and various filter media designed to maximise the filtration surface area and improve the filter’s ability to trap contaminants before they harm your engine and equipment. On-road or off-road, you can trust that the range of air filtration products at Filters Plus will meet your needs. We offer filters in a variety of styles, sizes and materials to meet any application. For products that last longer and work better, get in touch with our team.